^^^It’s a Taurus, it will never look good. However, this is very cool. The art of fixing cars is lost on many people, including car mechanics it seems. Nice that someone took the time to solve a problem like this, its just too bad they applied so much effort to a problem that didn’t need to be solved. Those things are available for $25 from almost anywhere, including junkyards selling on ebay if you are too lazy to even check out the local yard. What a waste. That energy and skill could have been applied to something, you know, not irrelevant and redundant. I would have reused the old dash controls with the new board vs make new controls. Though before considering the EATC board dead I would have attempted to repair it checking for cold solder joints and bad caps. I cannot believe some of you are bashing his efforts. Yes, it might be an ugly looking project but it works. And it is much more difficult and creative than a dude making a nonsense wrist watch with arduino. Somehow you eat up the arduino wrist watch but this project is bad, what gives? Is it an overkill? Maybe, at lease he has the knowledge and persistence to finish a project. I don’t think he deserves these personal attacks. Umm yeah, I just checked inventory, and hundreds of junkyards all over the country have the replacement part available to be shipped. A majority of them are asking from $20-$40 for the part. It’s cool that he wanted to spend the time doing this, but it’s prudent to point out that it’s a complete waste of time. There are sooooo many taurus/sables in junkyards, to think that a part like this is not available is crazy talk. This guy obviously only checked his local junkyards. Next time, use http://www.car-part.com – That’s your junkyard search engine for North America. 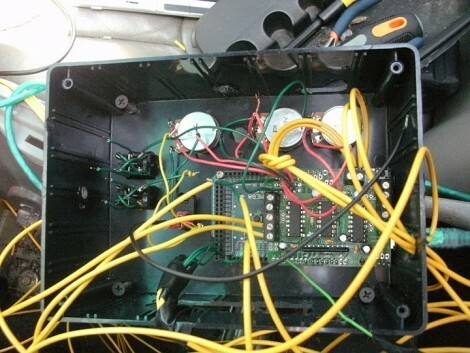 For the module he needed, select Computer Box – Not Engine, and then select “Temperature Control”. That being said, the failure in his original module was probably a really easy fix. I repair dash clusters, PCM’s, and other control modules on a weekly basis. They are rarely unrepairable, unless its related to a MCU die failure, in which case, I send the customer to car-part.com. Not trying to bash his efforts, but damn, this could have been fixed for under 30 bucks. Oh, and by the way, if he actually needed the control that mounts on the dash as part of the radio (instead of the control unit), then you select Radio/CD on car-part.com, and then select “AM-FM cass-CD cont, auto temp”. Once again, could have been had for about 30 bucks. Why not just buy a new car? @ Dan Mattox: Good job! For all you negative people out there: Pbpbpbpb! I would love for Dan to take a look at the heater/AC controls in my S10 Blazer. My stinking mechanics don’t seem to understand that I want it fixed, not switched from defrost to vent according to the season. Those are some idiots. Sheesh, they’re the sweatpants of cars. Since when has hacking been overly concerned with doing something the most economical way? Dan actually DID something and acquired some knowledge along the way – and he probably had some fun at the same time. Go Dan! I don’t really know anything about the hack, but wow, that car could use some cleaning. All this bunch of cables and electronics just to control the stupid fans huh? Did anyone look at his pics? Everyone is out of focus. And yah he probably spent $100 to build something he ciould have got for $30. In economic times like these that is a no no. Now if it had a blinky LED on that arduino, then we could all agree it was worth while. p.p.s ignore my typos. I need to start using chrome with spell check instead of IE. I just started working at a company that rebuilds industrial controls. It seems like you could almost make a post out of doing exactly what was suggested earlier, namely taking a multimeter the old mark I eyeball and attempting to find out what failed on the original control board and repairing it. Not that the project is that bad. They are keeping an old car running one way or the other. I applaud the attempt and success…..but not that Radio Install….yuck. See Crutchfield for install kits. Same exact thing happened to my 2000 Taurus! Now I know what to do :-O!!!!!!! Door lock control board in my ’94 Accord failed. Not as critical as the heater being wedged on full, but annoying nonetheless. Replacement part is about $75 at junkers, wasn’t available at my Honda dealer at all. Cracked open the welded plastic module casing. Tested based on service manual and tracked the fault to a bad solder joint on a relay that I hadn’t noticed from visual inspection. Reflowed all joints on the simple board, glued the case back together. Works great now. Total time for repair was like an hour, including disassembling the driver’s door paneling to get at the module. Its good to know that some one spend time on it and worked for the problem solution. There may be many firms online providing with this stuff.